Relationship Intelligence Platform that unlocks the hidden potential of your human capital to boost business results and deliver sustainable growth. There is no other platform like it on the market, so discover the benefits of Referral-AI. Referral-AI improves sales efficiency and marketing productivity, thus reducing the overall costs associated with customer acquisition. Referral AI unveils additional opportunities and connects your team with target accounts that don’t respond to marketing campaigns or sales efforts. Customer retention is challenging due to high employee turnover rate and organizational mobility. Referral-AI identifies new connections to key decision makers within your client-base, thus reducing churn and increasing your Customer Lifetime Value. Shorten your long nurturing cycles, and improve reach and effectivity of your marketing campaigns with quality referrals. Don’t let low conversion rate of lead generation campaigns limit your success. With Referral-AI, your HR team can gain invaluable insights on best candidates and reach top talents. Warm introductions and referrals from people you trust are the best way to reach and secure investors. Trusted referrals are the fastest way to open doors to target accounts and top level decision makers. Richard Branson famously said, “Succeeding in business is all about making connections”. Mr. Branson surely has little trouble getting his calls returned, but the rest of us could use a little help. 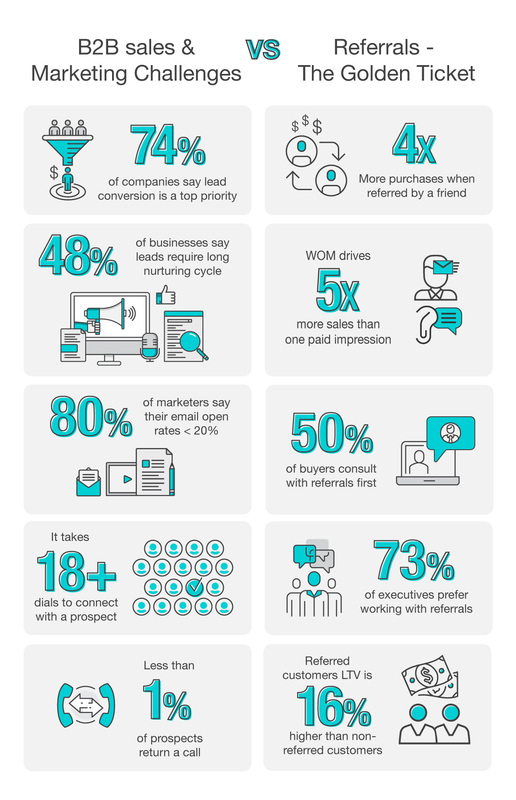 Boost sales with trusted referrals. “84% of B2B buyers start the purchasing process with a referral and peers’ recommendations” (Harvard Business Review). Competing for talent and avoiding hiring mistakes present significant challenges for hiring managers. Reach best candidates and get unsolicited recommendations based on trusted referrals. Referrals reduce time-to-hire by almost 50%. Securing investments requires referrals to Venture Capitalists (VC) and angel investors. Most VCs will only consider investment opportunities that are based on warm introductions. Reliable referrals are crucial to get VCs attention. Insurance agents, especially those selling to individuals, rely heavily on personal relationships. Referral-AI enables agents to systematically generate trusted referrals and turn their network into their #1 growth engine. Reaching donors is a never-ending task. Open doors to new, major donors with warm recommendations from people they can trust.